Ask fellow campers about "The Reef RV Park" and nearby attractions. We enjoyed our return visit to The Reef, where we also had some bodywork and painting touch-up done. The park is looking better and better with drastically improved WiFi connectivity and super-tidy appearance. The utilities all worked flawlessly and the staff are friendly and helpful. The weather was extremely windy one day, but the balance of the trip was absolutely perfect with great temps and nice swimming. We will happily return. We camped at The Reef RV Park in a Motorhome. Access to the park from the city requires you to drive quite a way down a wide dirt road. It is not smooth and not marked and very dusty. Check in was not quick or easy. I had only wanted to stay one night as we were meeting friends at a different park the next day. I was offered a Beach Front site for the same price as an inside site but I would have to stay four days to qualify. She said that the park was fully booked for the next little while and so were all the other parks in the area. I finally convinced the young lady that no matter what, I was only staying for one night. She did give us a Beach Front at the discount but I noticed that the park was less than one quarter full. The parameter roads are wide dirt and very Big Rig friendly. Beach Front services are shared between two spots and are located at the rear. If you have a Coach, it is better to nose in (the view is spectacular) if they place you correctly. Your services will then be on the left side of your unit but you will need long Shore Connectors. I had plenty of Electric Cable and Water but did not bother hooking up the sewer. The water is good for drinking and cooking but I used a filter anyway. The electricity seemed okay, but again, I used protection. The site was sandy dirt, quite level and reasonably wide. There was no table or fire pit. There is free Wifi but it was very spotty (probably not the parks fault as this seems to be common in this part of Mexico). The park is basically a flat, dirt parking lot. It is fenced and gated but the only thing it really has going for it is the view of the Sea of Cortez. The beach is rough sand and not nice. There is a Restaraunt and Bar right next door. Wrecked at the Reef, is quite famous and popular but we didn't partake. We paid $40.00 US for a site that was listed at $50.00 but still feel we did not receive good value. We feel that his would be better priced at $25.00 night. We will not return. We camped at The Reef RV Park in a Motorhome. REVIEW: The Reef is rather large with over 200 sites, 70 facing the ocean. Sites are well laid out and large; the roads too are ample. Getting there off of Hwy 8 is easy on paved streets and a couple roundabouts, but the last ~¾ mile is a dusty, washboard sand/dirt street (wonder why it's not paved properly? )-if driving a motorhome, go very slow or you'll knock everything off the cupboard shelves. There is a stop sign and park signage in the middle of the sand where you turn left toward the park and 2 restaurants. Just before the restaurants is a building on the right with a placard reading "Tienda de Servicios" outside a gate. Turn right thru the gate, park on the right and walk back into the Tienda office to register. The appears to be all asphalt but it is covered with a thin layer of sand. It's a good hard surface both for parking and driving; most of it is smooth without potholes. The beach is rough sand, not the fine particle type. There's no vegetation like trees or bushes (well, there are a dozen palm trees on the inland side), but that's the nature of the area along the beach. The WiFi worked well for us, but the park was only about 10% full. Water pressure varied greatly, electric consistent ~125v on 50amp. DISH satellite brought in Phoenix locals (we didn't call in any location change for our previous 3 locations in AZ either) as well as all the rest. Six wide access points to the beach make getting there easy for those parked away from the beach. If not on the ocean, sites at that end of the alphabetical rows will be closest with the best views-#14 for coaches and probably #13 for 5th wheels. Low numbers in each row will be closest to the bathrooms, especially rows F thru M. The ocean view is wonderful, and that is the point of coming here. If you want a lot of park amenities, go stateside. And, of course, the park is full of Americans. We like it and definitely plan to return. We camped at The Reef RV Park in a Motorhome. Drive slowly, watch for the often-camouflaged stop ("Alto") signs. On many streets the speed limit is 15mph, so don't push it. You must drive into town to do your shopping--it is not a short walk from the park. Stayed here for 3 nights to see what this park is like. The wind is very strong here as the campground is out in the open and there is nothing to shelter the area. At times, there is a lot of dust and sand in the air because of the wind. Sites here are more than adequately sized. We had no problem backing in and parking our vehicle beside our 5th wheel. Vendors who wash and wax camping units are a bit pricier than others in the area, so we chose not to take advantage of their service. WiFi, sewer, and electricity all worked very well and we had no issues with any of them. There is an excellent Italian restaurant adjoining the park. There is also a great bar/hamburger place next to the park as well. We camped at The Reef RV Park in a Fifth Wheel. Bathrooms barely acceptable. Dirty, toilets did not flush. Water standing in shower. Peeling paint and unfinished. Water service at site was off about half of the time. Internet was non-ezistent or very spotty. Dumpsters full to overflowing. Area very trashy. The Reef is suppsed to be the best in the area so am just glad I did not go anywhere else or would not have stayed at all. Very disappointed after all of the good reviews. We camped at The Reef RV Park in a Tent Trailer. We had a lovely beachfront site. Easy hookup. Good Water. Electric was a real problem. Voltage in Mexico is 137volts on each leg. Our transfer switch would not accept the high voltage. Some campers bypassed this, I'm not so brave, so we used generator by day and inverter by night. Still had a wonderful week. There is a 1/2 mile stretch of sandy dirt road getting into the park. Well traveled and easy to drive, just dusty. We camped at The Reef RV Park in a Motorhome. The Wrecked at the Reef restaurant, on site, is excellent. Mary's fish restaurant on the Mercado was excellent for lunch. Plan to have your car washed when you park for lunch. They did a good job. The Reef RV Park was a great place to stay. We had problems with electricity the first night but the guys from the Rv Park were very helpful and were able to fix it. We had a great time and we are definitely coming back. We were very close to the beach and it was a great day. Water pressure was perfect and weather was just perfect. I recommend this place to anyone. you wont regret it staying there. We camped at The Reef RV Park in a Fifth Wheel. $20 interior, $35 beachfront. Cash only at the reef. Always prefer Reef over other parks in area..less crowded...50 amp service...bigger sites...That being said, it is just a large gravel/sand lot, with utilities, that's truly on the ocean. We prefer first row interior since our fiver doesn't have a rear window..but our side views are spectacular, so we prefer the #13 sites..this time E-13. Spent three weeks this year. No reservation as it was after the more crowded Easter/Spring break month...but even then we found out the park was only about 1/2 full. Reservations never really needed unless you want beachfront during Jan...then you might have to move around during your stay as your site might be reserved during your visit. Power was fine, water pressure varied a lot, sewer fine. Wi-fi at our site was ok..adequate for email, surfing etc, but not video of course. Others complained about poor wi-fi at their spots. At&T cell works great..3g. Direct Tv solid and you see LOTS of dish and direct tv dishes all over puerto penasco. Had fiberglass work done to touch up dings and scratches on my rig...fantastic work by Oscar at a GREAT price. Finished up with a full 40' wash/wax on my rig and truck for just under $100!! Windy generally. Tremendous tides, wonderful beachcombing. Short drive into town. Vendors on beach, no problems...massages, pedicures etc right at your rig. Propane truck comes through. Security. English spoken almost everywhere. Dollars or Pesos. Pemex takes credit cards now in some locations. What's not to like? Definitely be back. We camped at The Reef RV Park in a Fifth Wheel. pesos, us dollars or credit cards accepted pretty much everywhere. Cash only at the reef however. Diesel and gas high now compared to AZ prices. Fill up in AZ. Groceries at Lei's. Sam's Club/Wal mart next door. Be ready for potholes, topes and drive slowly! We didn't actually camp here this year (we stayed in a condo), but we spent a lot of time there visiting friends who were here for a week. The park is unchanged from previous years, except that the Wi-Fi signal is stronger (I noticed a new tower in the middle of the park), although the Internet connection still varies from poor to excellent hour by hour. Our friends occupied three sites, and they all reported good 30/50 amp power and much better water pressure than we have had in previous years. There were coin-operated dryers in the laundry, but the washing machines were here only because they had been rented for a caravan that was here earlier. They were supposed to disappear any day. The unpaved road to the park and to nearby La Cholla seemed to be graded and watered much more frequently than in previous years. The desk staff speak perfect English and can arrange for a mobile RV tech if you need one. One of our friends had a plumbing leak (broken fitting at the water heater) when they arrived, and the mobile tech fixed it for $20. The desk is also the contact for the crew that washes rigs in the park. They will wash AND wax your rig for $1.50/foot, plus $10 to wash the roof. They do an excellent job and are happy to schedule it to just before you leave. In my opinion, this is by far the best park in Puerto Peñasco. Compared to the other full-hookup parks in town, the sites are much, much bigger and the prices are much lower. It's about three miles to downtown, but it's an easy drive. Unless you want a beachfront site ($35), no reservations are ever necessary. 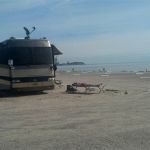 We prefer the $20 sites, which are still a few steps from the beach but don't have other campers and the roving vendors right in your site. We camped at The Reef RV Park in a Motorhome. Adjacent to the park, the bar food at "The Wreck at the Reef" is still good, and the fine dining at the Mare Blu is better than ever and quite reasonably priced. For inexpensive American and authentic Mexican food, go a couple miles down the road to Xóchitl's (pronounced sew-cheese) Cafe in La Cholla. It is owned by an American expat. Pay in either pesos or dollars (like almost everyplace on Puerto Peñasco). I love the chilaquiles there, and their tortilla soup is a hearty meal. We stayed here 4 nights with a waterfront site. Park was not very busy, but staff is attentive and very helpful. Hot days but fresh breeze always and very cool nights. Would have rated higher, but WiFi is sporadic (sometimes awesome, sometimes non-functional), and location of power/water is at opposite end of rig if you park facing the Sea of Cortez. Great view, but this arrangement means very difficult to connect to power/water/sewer if in a long rig. Some may find it a bit primitive (not all paved and manicured) but we loved the experience. We camped at The Reef RV Park in a Motorhome. The rate cited is based on the monthly rate of $500US, including utilities. We spent three months there this winter. Had a great time, again. The park was never more than one third full, and that was only President's Day weekend. Most of the time it was less than 20% occupied. The desk staff speak excellent English. The roving security staff are very friendly. Sites are large, with excellent 50 amp power. Wi-Fi varied from barely usable to quite good. Water pressure varied second by second from 20 to 40 PSI. The vendors on the beach brought us fresh shrimp, burritos, and tortillas every day, and tamales some days. There is construction going on again for the proposed cruise ship port, but the owner's son said that the RV park will stay open until they have financing for the proposed marina. The Reef is three or four miles from town. We camped at The Reef RV Park in a Motorhome. You can pay for everything in US dollars if you choose, but you do a lot better withdrawing pesos from an ATM and paying for everything in pesos. Xochitl's Café in La Cholla, about a mile or so from The Reef has excellent food at good prices. Surprisingly, the Chinese restaurant next to Rosy's has very good food; very large, inexpensive servings. We have never had a bad shrimp from the vendors at The Reef, and we usually bought a pound twice a week. We stayed in a beach site for a week. The beach is beautiful, with easy access. The security person is courteous and helpful. The front desk person always seemed to be busy when we had questions. The showers and restrooms were abominable, none of the washers or driers worked. We did not use the water for drinking. The beach sellers were mostly courteous and took "no gracious" for an answer. Some were aggressive; one looked into the window of our RV, trying to sell us something. We found the park to be quiet, with friendly neighbors. The ride to the shops and restaurants was easy and short. As long as a beach site was available, we would stay here again. The wifi hardly worked. We camped at The Reef RV Park in a Travel Trailer. For fish in the malecon, see Gomez. For great happy hour margaritas and food and a great beach, go to Puesta de Sol. For an excellent breakfast, go to Koffe Haus. Great venue for activities such as beach, kayaking, hiking. No activities, no pool. Full hook ups, watch the elecricity surges. A little out of town, but not as crowded as the in town parks. When we return, this is the park we'll come to. Very good staff and security. We camped at The Reef RV Park in a Fifth Wheel. The rate cited reflects a monthly rate. This is our first time back in this park since 2007. There is now free Wi-Fi. There are finally functioning (clean) bathrooms and showers. There is a small laundromat; it had two working washers and two working driers while we were there. It takes US quarters, which can be obtained at the RV park office, but only occasionally. The sites are still very large, with 50 amp service at most of them. When we arrived we were allowed to pick our own site. We prefer the $20/night ($500/month) regular sites over the $35/night ($700/month) beachfront sites. The regular sites are oriented such that you can use your rig as a windbreak when the north winds blow, and they are isolated from the roving vendors on the beach. The vendors are not allowed to enter the park uninvited. To be fair, though, they all cheerfully move on when you tell them "No thanks". There are 48 beach-front sites and 168 other sites. At the first site we had, the voltage was quite high--132+ volts at night. We had to keep a space heater going all night to keep the voltage low enough that our surge protector didn't continually shut off power to the rig. We moved to another site later, and the voltage was down in the mid-120s. The park was virtually empty December and January (10-15 rigs), although a couple dozen rigs showed up between Xmas and New Years and on a few weekends. In February there were as many as 40-50 rigs on the weekends. When Spring Break started (second week of March), the park was about a third full, with all the beach-front sites taken. Before Spring Break, this is generally a very quiet place to be, although there are occasionally folks with noisy off-road vehicles in the park. During Spring Break people were shooting off fireworks on the beach every night. One bozo was exploding quarter sticks of dynamite, scaring our dog into a quivering mass of fear. The white-linen restaurant on site has a new chef. The meals are outstanding. The bar (Wrecked At The Reef) has been remodeled and is now a modern, pleasant place to have a drink and good food, either indoors and outdoors. A far cry from the dingy hole it was six years ago. Staff at the RV park and both restaurants were very pleasant and spoke excellent English. We think it’s the best RV park in town, and we have looked at them all. We camped at The Reef RV Park in a Motorhome. Came down from Las Vegas for Christmas week. Made fully paid reservation but when we arrived the park is absolutely EMPTY..A total of 12 various rigs here. Very sad actually. Strong 50 amp service..voltage a bit high..running around 132, water and sewer OK. We have beachfront. Wi-Fi included and very strong. Town is also quite barren of visitors and locals need business. No hassles/no problems...a nice getaway. Other parks were very empty as well. Would return. Hope things improve for these folks. We camped at The Reef RV Park in a Fifth Wheel. pesos, us dollars or credit cards accepted pretty much everywhere. Cash only at the reef however. Diesel and gas high now compared to AZ prices. Fill up in AZ. Groceries at Lei's. Sam's Club/Wal mart next door. Be ready for potholes, topes and drive slowly! Adjacent to the park, the bar food at "The Wreck at the Reef" is still good, and the fine dining at the Mare Blu is better than ever and quite reasonably priced. For inexpensive American and authentic Mexican food, go a couple miles down the road to Xóchitl's (pronounced sew-cheese) Cafe in La Cholla. It is owned by an American expat. Pay in either pesos or dollars (like almost everyplace on Puerto Peñasco). I love the chilaquiles there, and their tortilla soup is a hearty meal. Are you affiliated with The Reef RV Park ?